This project is both decorative and useful! 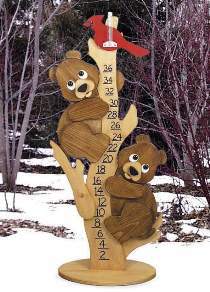 The bears and the tree keep track of how much snow has accumulated. The cardinal holds a rain gauge to measure rainfall. This backyard project is easy to make and easy to paint. Patterns drawn FULL SIZE. Project measures 47-1/2"H.